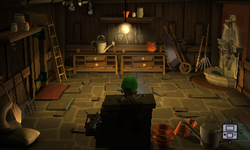 The Tool Shed is a room inside of the Haunted Towers in Luigi's Mansion: Dark Moon. The Tool Shed can be accessed by taking the door on the right of the East Hall. Inside the Tool Shed are many cabinets with various gardening tools, such as watering cans, pots, and trowels on them. There is a large fountain on the right side and several shelves with containers with pots. There are stacks of potted plants, a shovel and a hoe, and large sacks of soil. The door on the left leads back to the East Hall while the door on the right leads to the Garden. Inspecting the fountain causes Luigi to be sent into the Toolshed Stairs. In B-2: The Pinwheel Gate, Luigi must go to the Tool Shed to chase after one of the Hiders that stole a pinwheel vane. Before he fights the Hider, Luigi needs to fight a Slammer and two Greenies. After inspecting the Garden, Luigi needs to use the secret passage behind the fountain to advance. In B-5: Doggone Key, the Tool Shed is the room that the Polterpup first hides in. After finding the Polterpup, chasing it into the Garden, and returning to the Tool Shed, all the furniture is gone. Using the Dark-Light Device and revealing all the furniture causes this mission's Boo to pop out of hiding. In B-Bonus: Hostile Intrusion, the Tool Shed may be one of the rooms that has ghosts. This page was last edited on February 19, 2019, at 21:18.